A pagoda is the general term in the English language for a tiered tower with multiple eaves common in China, Japan, Korea, Nepal, and other parts of Asia. Most pagodas were built to have a religious function, most commonly Buddhist, and were often located in or near temples. This term may refer to other religious structures in some countries. In Thailand, «pagoda» usually means the same as stupa while in Vietnam, «pagoda» is a more generic term referring to a place of worship. The modern pagoda is an evolution of the Indian stupa, a tomb-like structure where sacred relics could be kept safe and venerated. The architectural structure of the stupa has spread across Asia, taking on many diverse forms as details specific to different regions are incorporated into the overall design. Pagodas attract lightning strikes because of their height. This tendency may have played a role in their perception as spiritually charged places. Many pagodas have an antenna at the top of the structure known as a finial. This antenna is designed in such a way as to have symbolic meaning within Buddhism; for example, it may include designs representing a lotus. The finial also functions as a lightning rod, and thus helps to both attract lightning and protect the pagoda from lightning damage. Standing 83 meters tall, the octagonal nine-story pgoda of Kyoto’s Hoshoji was the tallest pagoda of Japan. Like many wooden pagodas, it was destroyed by fire. The Sakyamuni Pagoda, built in 1056 in Yingxhain County is the tallest remaining wooden pagoda in the world. The pagoda Thatbyinnyu in Bagan is as tall as a 17-story building. While most pagodas were built for religious purposes, they can also be used for enjoying distant views, for military supervision (ie: use as watchtowers), or as navigational aids to travellers and ships. Some pagodas, such as the Three Pagodas in Dali, have also become symbols of their locality. 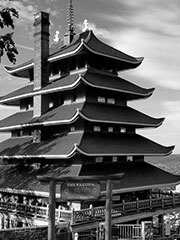 The earliest example in the Oxford English Dictionary of the use of the word pagoda in English is from 1634. According to Alain Rey’s Dictionnaire historique de la langue française (rev. ed. 1995), the word first appeared in French as pagode in 1545, meaning «temple of an Eastern religion» and deriving from a Portuguese word dated from 1516. The derivation is uncertain. Possible roots are the Dravidian pagodi or pagavadi, a name of Kali derived from the Sanskrit bhagavati («goddess»), and the Persian butkada («temple»). According to Liang Ssu-Cheng’s A Pictorial History of Chinese Architecture (MIT Press, 1984), the word pagoda is derived from the Chinese 八角塔 (in pinyin, bā jiǎo tǎ, hence «pagoda»), meaning literally «eight-cornered tower.» Pagodas with an octagonal base were an extremely popular pagoda design in the late Ming Dynasty and early Qing Dynasty periods when Europeans were coming into contact with China. «Pagoda – comes from Sanskrit «dhatu garba». From the harmika in the stupa, lies the anda (dome) or world egg. Here resides the sacred relic, with their dhatus (magic elements) which like the eggs, possess the power of life. The power of this womb and its world egg is transferred through the sacred altar that stands over the gharba (the womb), namely the harmika, and becomes a force for spiritual life and renewal. Therefore «dhatu» refers to the magical, sacred relics (i.e the Buddha’s) and «gharba» the womb. From dhatu gharba comes the Singhalese «dagoba». In Burma and other East Asian countries, the daoba becomes «pagoda». In the 18th century, Chinoiserie, a style based on Chinese and other Far East designs became popular in Europe, introduced by the burgeoning trade and travel routes. An example of this is the pagoda in Kew Gardens, England, which was completed in 1762 as a gift for Princess Augusta, the mother of George III. In an unexpected twist, a «pagod» became the English name in the luxury trade for a porcelain figure of a Chinese seated god. The Sakyamuni Pagoda, built in 1056 is the tallest remaining wooden pagoda in the world. An Quang Pagoda, a meeting place for Vietnamese Buddhist leaders in Ho Chi Minh City, and site of the Institute for Dharma Propagation. Most pagodas with a religious function are Buddhist stupas; however, the Daqin Pagoda in China was an exception, being built by early Christians. Jade Chop Pagoda in the Three Gorges region of the Chang Jiang (Yangtze) river, China. Toji, the tallest wooden structure in Japan. The Porcelain Tower of Nanjing, a wonder of the medieval world in Nanjing, China. Phra Pathom Chedi the highest pagoda or stupa in the world Nakhon Pathom, Thailand.